Stormy space weather (more than stormy ground weather during flight transfers in Helsinki) didn't assist in making one of the few Italian Dxpeditions to the far European north a lifetime dream come true. A number of nice receptions in our log still demonstrate that conditions are radically different with respect to our best locations in Italy. As a feasibility study, however, our mission to Oulu - a high-tech university town in Finland, not too distant from the Arctic Circle - was a complete success, one which will encourage us to be back, perhaps very soon. In a sense, escaping local bad DX factors to try one's luck at Northern latitudes, could be considered as cheating. In our view, experimenting such a huge gap in listening conditions can really be challenging and in front of increasing electrical noises in the mediumwave band and of the potential ill effects of crazy DRM experimentations being put in place all over Europe, we wanted to give this a try before it could be too late. In spite of a theoretical solar minimum, we have unfortunately chosen to leave in the wake of last mid-January massive coronal activity, with heavy proton storms at ground level. And mind you, protons can really be noisy at 65 degrees North, wiping out almost every useful signal at low frequencies. For us, it took at least two days for the storm to subside. 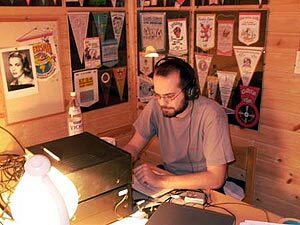 First hints at Oulu as our Dxpedition site came during a business trip one of us took last year and was later confirmed by a suggestion from well known Swedish Dxer Henrik Klemetz. Henrik mentioned one his contacts, Jari Ruohomäki, an active Dxer and a regular member of the Lemmenjoki crews, owns a well equipped cottage in the outskirts of Muhos, a small town 35 km SW from Oulu. Jari confirmed us his property was available for rent. The cottage includes four communication receivers and seven very long Beverage antennas pointing to bearings covering areas from the Southern point of Latin American up to the Great Lakes area of the Us. Future plans for this location include mounting up one or two more Beverages toward Asia/Pacific and possibly Alaska (a US State Jari is not particularly keen about, having logged all Alaskan MW in Lemmenjoki). Temporary antennas can be erected, but that's a feat which snow on the ground can make a bit hard. The cottage can conveniently accommodate two to four persons and is very well equipped and comfortable even if one doesn't take radio interest in consideration. What's furthermore attractive about Oulu/Muhos is the fact one can reach Oulu in less than six flight hours from Milan, via Helsinki/Finnair (other routes to Oulu include Stockholm by Sas/Blue1 or Tampere via Ryanair). Blizzards in South Finland somewhat delayed our arrival. Jari has been so kind to pick us up at the airport, but car rental is possibile, albeit a bit expensive, and Muhos can be reached in less than 45 minutes from the regional capital town. 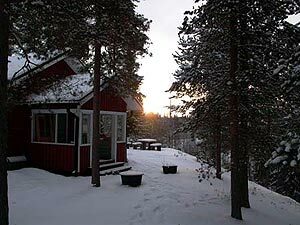 Jari's cottage lays at approximately 10 km from Muhos, in a sparsely populated forest. Beverages can be mounted from 230 to perhaps 090 degrees, but backlobe effect helps in pointing to directions where a downhill slope around the house would make it difficult to put wires up. Temperature in January was quite stable around -8 to -10 Cº, down to -15 when we left. Jari tells us it can well go down to -25. The Sun rises around 10 local time and sets around 15.30, but light hours decrease sensibly in December. And now to our impressions DX-wise. In spite of potentially good K index values toward the end of our weekly stay (21-28 January 2005), we weren't able to experience any exceptional opening toward North American, Michigan being one of the furtherst catches. The same holds true for La Plata and Chile openings when K values and Polar absorption were high: we had only a very short opening toward Peru. One the highlight of our continous listening sessions has been the Asiatic log, with many of the most powerful stations from Japan to Pakistan. That's something a Southern European Dxer can surely appreciate, since co-channel listening is almost but impossible South of the Alps. When darkness is at its deepest you can dx in Oulu from South West to North North East directions from 22 utc to 12, but one cannot rule completely out the afternoon and early evening for Far East and Africa. The extreme North of Lemmenjoki can offer more opportunities for sure, Jari says, but he's convinced he will be able to go for Marshall Islands in Oulu too and will set for that next autumn. Beverages (a 232° [850m], 245° [650m], 258° [850m], 271° [1100m], 282° [1050m], 293° [950m], 305° [950m]); Receivers: 4xJRC-525, Palstar R-30. 21-22 January. (Alvestad Report). Few weak signals on an almost dead MW band. I mean, few *european* signals. 22-23 January. (Alvestad Report). The following night the propagation was better, at least during the LA sunset. Fair signals from Southern Brazil (Cumbica-1500 e Continental AM-1520) and Uruguay. Not a single NA signal at local dawn. 23-24 January. (Alvestad Report). Huge opening towards the Indian Subcontinent in the afternoon. We don't konw if such event is usual during poor conditions, but both the number of stations logged and their signals were quite impressive. No TA signals at night. Highlight: Pakistan on 1340.94 kHz. 24-25 January. (Alvestad Report). Weak asian openig in the afternoon, few NA in the morning and stong signal from Thunder-1530. 25-26 January. (Alvestad Report). Caribe and Centroamerica during the night. 26-27 January. (Alvestad Report). Fair opening towards the Great Lakes Area, but actually with weak signals. Early at night, Portorico and few signals from Peru. 27-28 January (Alvestad Report). Weak signals, without a clear propagative pattern: Afghanistan in the evening, then some feeble brazilians and scattered signals from Colombia. 1116 25.01 1620- AIR Srinagar, India. 1169 23.01 2045- IRIB 1, Iran. In // 1503. 1340.94 23.01 1615- R. Pakistan, Bahawalpur, Punjab, Pakistan. 1377 26.01 2105- Tibet. In // 4820 kHz. 1413 24.01 1600- JOIF Fukuoka, Giappone "KBC Funky Radio". 1431 23.01 1715 Xinjiang PBS, Cina. In // 4980 kHz. 1530 23.01 1540- AIR Agra, Uttar Pradesh, India. In // 1566 kHz. 1575 daily 1600- R. Asia via UAE Radio, Dubai. Moved to 1557 kHz few weeks ago. 1575 daily 0015- VOA Thailand. 1602 27.01 1600- R. Khost, Afghanistan. 860 27.01 0540- CJBC, Toronto, ON, Canada. In ff. 1150 25.01 0640- pres. CJRC, Ottawa, ON, Canada. In ff. 1370 25.01 0630- pres. WDEA, Ellsworth, ME, USA. mx easy listening non stop. 1430 27.01 0640- WENE, Endicott, NY, USA. "Fox Sports Radio"
1680 27.01 0020- WLAA, Winter Garden, FL, USA "la 16-80"
WLUZ, Bayamon, Portorico "La Romantica 1600"
1400 28.01 0500- HJKM Emisora Mariana Radio Multicultural, Bogota, Colombia. 1470 22.01 2345- ZYJ616 R. AM de Parelhas, "A radio da familia seridoense". 5005 27.01 1650- R. Bata, Guinea Ecuatoriale. 5066.49 22.01 1550- R. Candip, Bunia, Congo. In ff until 16.00. 1380 24.01 0520- Unid rel ss "La Iglesia "Cristo Significa Esperanza" esta presentando el programa "Buscando la Ruta Perdida". Corporacion, most likely.